In 2009, international headlines were made when Richard Phillips, the captain of the cargo ship Maersk Alabama, was taken hostage by Somali pirates for four days before being rescued by the US Navy. He wrote a book about his experiences, Captain’s Duty: Somali Pirates, Navy SEALS, and Dangerous Days at Sea, and now Paul Greengrass – the director the of The Bourne Supremacy, The Bourne Ultimatum and, more relevantly, United 93 – has brought the story to the screen in the impressive Captain Phillips. We have all heard about Somali pirates and how dangerous the journey around the horn of Africa can be for cargo ships without really knowing how it works. The notion of seafaring pirates seems so old-fashioned that it is, for the uninitiated, difficult to fathom how the practice still takes place in the present day. As such, part of what makes Captain Phillips so interesting is the procedural nature of the film. Almost a docu-drama, the film shows us how high seas piracy functions in the modern world. We get to see not only how a small group of pirates can take possession of a massive container ship, but also the processes the container ships go through in the face of a pirate threat. But don’t let Greengrass’ devotion to detail and process fool you into thinking this film is in any way bland. Captain Phillips is intense, gripping storytelling. Emotionally, the film is carried by a strong leading performance from Tom Hanks. Phillips is a veteran seaman. When he is aboard he is all business. He likes to be prepared, and initially gets his crew offside by insisting on running emergency drills. But when those emergency threats become real as the boat is approached by a skiff containing four pirates armed with automatic weapons, there is no one the crew would rather have in charge. Alongside a strong sense of duty and responsibility, Phillips is a cool head under pressure and a quick thinker. He is a schemer. The brilliance of Hanks’ performance is that so much of it is about what the character is thinking. But what propels this performance to sit among the very finest work that Hanks has produced are the post-trauma scenes in which Phillips, who has to this point been so measured, is simply unable to process the incredible ordeal he has just been through. Those scenes are devastatingly effecing. Hanks is a certainty to earn a Best Actor nomination at next year’s Academy Awards and will be a real chance of joining Daniel Day Lewis in the three Oscars club. Hanks is the only name in the cast unless you count the blink-and-you’ll-miss-it appearance from Catherine Keener as Phillips’ wife at the beginning of the picture. However his performance is complemented by some equally strong work from the supporting cast, most notably the four first time actors who deliver impressively nuanced performances as the Somali pirates. One of the great strengths of Captain Phillips is the way that it chooses to humanise the Somali characters when it so easily could have presented them as a terrifying other. Greengrass breaks from Phillips’ point of view by subtitling the Somali characters, so that unlike Phillips we can always understand what they are saying. In doing so he gives us access to those characters. Instead of one collection of bad guys we see four distinctly different men, displaying different emotions and reacting to the experience, and to the figure of Phillips, in individual ways. Their captain, Muse, is a man acting out of desperation. Not just the desperation of poverty which compels him to steal and kidnap to stay alive, but the desperation to prove himself to the other men in his village who deride him for his slight build. 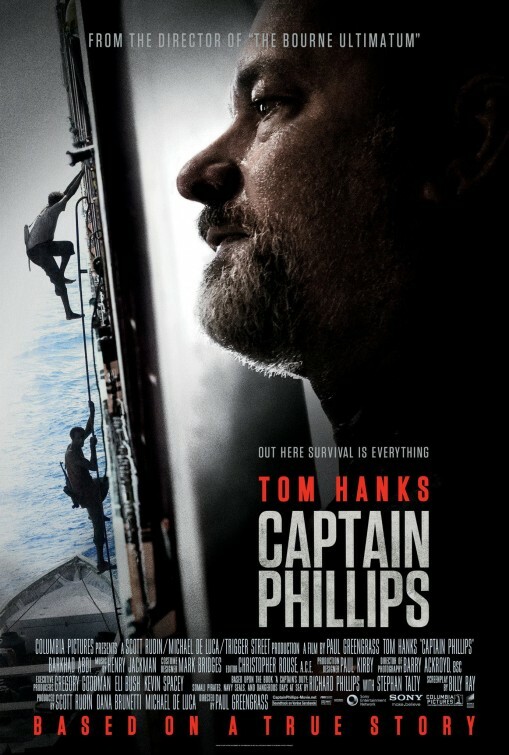 He goes on his own emotional journey in the film as he attempts to prove himself as a leader, with the way he finds himself simultaneously drawn to and pushing away from Hanks’ Phillips because he possesses the leadership qualities Muse aspires to being really interesting. The humanising of the Somali pirates is helped by the fact that despite being the aggressors and as such the villains of the film, they are also consistently the underdogs, and as an audience there is something in us which is compelled to sympathise with the underdog. It is always impressive when a film based on high profile actual events, and therefore with a well-known outcome, manages to create and maintain legitimate dramatic tension. With Captain Phillips, Greengrass goes much further than simply maintaining dramatic tension. He delivers one of the most intense, gripping and interesting films of the year.